The leading independent specialist for windscreen replacement and windscreen repair based in Inverness and serving all of the Inverness area. 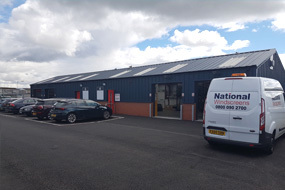 National Windscreens Inverness fitting centre provides windscreen replacement and windscreen repair services to businesses and individuals throughout Inverness and the Inverness area. Inverness is located in northern Scotland and offers a rich variety of places to visit with many activities to enjoy around the city. Inverness is serviced by the A9, A82 and A96 which also connect the city with the rest of Scotland. One of the city’s many tourist attractions is Inverness Castle, currently used as a courthouse. Additionally, St. Andrews Cathedral dominates the landscape on the banks of the River Ness. Inverness is truly one of Scotland’s most beautiful cities to visit. The Inverness windscreen fitting centre and its mobile vehicle glass technicians service the needs of Inverness and the surrounding area including Nairn, Dingwall, Ullapool and Muir of Ord. With 108 fitting centres and over 800 mobile technicians, National Windscreens operates the UK's largest windscreen repair and windscreen replacement network. The company provides low cost, high quality windscreen replacement and windscreen repair from its Inverness fitting centre 24 hours a day, 7 days a week, 365 days a year. Repair and replacement of all types of vehicle glass including windscreens, rear windows and side windows is undertaken throughout Inverness and all of the Inverness area.